A Water Meter/Check Valve can be picked up at the Highway Department. Please contact the town office if you have any questions regarding connecting to the water district. • The primary benefit of a community water system is that those Town residents within the Water District will have a safe and reliable drinking water supply. There will also be greater fire protection capability. Also, the market value of homes within the Water District may increase. • Residents are not required to hook up to the water system. However, if your property is within the boundary of the Water District, you will still be required to pay the debt repayment portion of the annual user cost. 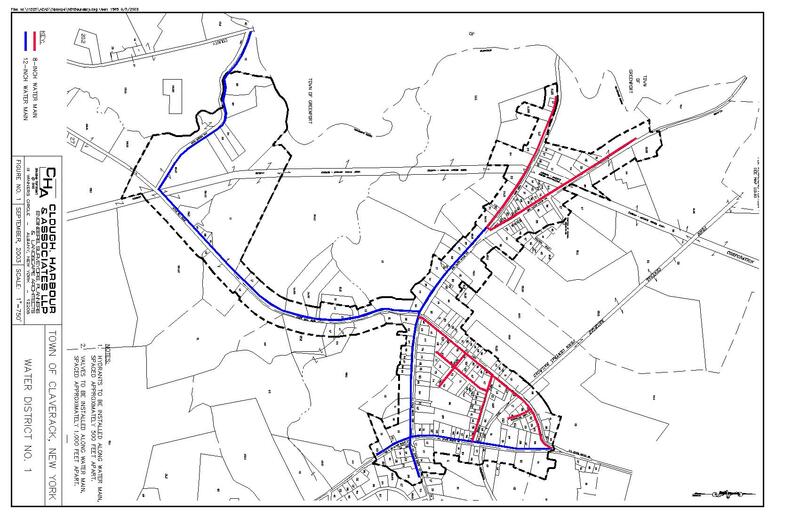 • The water system consists of a booster pump station, meter pit, water storage tank (which will provide a reserve for fire fighting and emergency purposes), fire hydrants and approximately 6 miles of water main to deliver drinking water to Town residents in the hamlet of Claverack. • The source of our water supply is from the Town of Greenport. We’ve installed a municipal water softener within the booster pump station to treat the hard water coming from Greenport and the water is also treated wih a chlorinator. The booster station is inspected daily to record readings on the amount of water usage and the amount of chlorine used. Every month, water samples from different areas within the water district are taken to a laboratory to have the water analyzed to make sure we meet the requirements of the NYS Department of Health. • In order to hook up to the water system, there is a copper pipe from the water main to the property line for each property listed within the Water District. Each property owner will be required to hire a contractor to install a line from this point, across the property, and into the home’s plumbing system. 95% of the properties are a ¾-inch line and copper pipe is required to be used for the installation. An estimated cost of $15 per foot at an average of 100’ line would cost $1,500. A water meter is required to be installed at your home’s plumbing system along with a check valve. This water meter and check valve is provided by the Town with no cost to the property owner. Upon completion of this installation, the Town will inspect the install and place a “Reader” on the water meter. • Water usage per meter are billed quarterly and are subject to change based on the Town’s annual budget and/or water rate increase imposed by the Town of Greenport. $74.39 Minimum operation and maintenance charge per quarter, regardless of the amount of water used. Out of a possible 266 customers, we have 173 active hookups. • The water we provide is treated with chlorine and Culligan water softeners before we pump it to the residents in our water district. The water we provide prevents contamination from spills or sewage. • Our water is tested on a daily basis to insure its purity. • You won’t be deprived of water due to a power outage. • When people switch to the water service, there is less maintenance on their own systems. Being that the water is typically cleaner than well water, there is no need to maintain softeners, switches, well pumps, and tanks. Annual Drinking Water Quality Report for 2016 for the Town of Greenport is available for viewing at the Claverack Town Office during normal office hours.